Escarole Salad | Good. Food. Stories. It ain’t easy to make shcarole these days. What I mean is, you gotta spend shcarole to make shcarole. Ya know what this Occupy Wall Street movement is really about? Shcarole. Shcarole, or as it’s more properly known in its vegetal form, is escarole: a dark, leafy, hearty green, rich with vitamins, that can be eaten in a salad, sautéed, or boiled in a soup. Somewhere, probably about 100 years ago, an immigrant from Naples earned a big wad of American dollars, and in the accent of his native city promptly nicknamed it shcarole (scarola in textbook Italian). My poor father used to be tortured by shcarole. He once complimented his mother on a typical Neapolitan soup she had made of shcarole e fajole (scarola e fagioli, or escarole and beans). She meant well and every Monday when he stopped by the old house to visit, she’d announce, “I made shcarole just for you.”Always more of a Livia Sopranothan a sweet Italian nonna, the shcaroles weren’t always made with love. Cooking was never her joy. Over time, the weekly soup turned into a sludge pile of overly boiled greens that my father had to choke down under her watchful eye, lest he ingest a litany of Italian guilt. He’d come home at the end of the day, peer into the oven hopefully or open a simmering pot on the stove and announce to my mother, “I had to eat my mother’s shcaroles. Again!” To this day, I don’t think he can look a head of escarole in the face. I avoided escarole well into adulthood. I felt otherwise after I warmed my face over a bowl of warm escarole and bean soup in Florence, fragrant with garlic and thyme. I gained additional respect when I had escarole sautéed with anchovies and nutmeg during a trip to Minneapolis from 112 Eatery’s small plates menu. Escarole can span a wide range of dishes. Chop some up and throw it in minestrone soup. Make escarole Frenchy by baking in a ceramic pie plate smothered in Gruyère cheese. Use the gently bitter leaves in a stir-fry with garlic and pork. But whatever you do, don’t overcook them.The key is to heat escarole just to the point that the pale base of the leaf closest to the stem just turns translucent. Escarole is in season in the fall, so pick a head up at your farmer’s market and get the most nutrients and flavor as possible by using it for a rich dinner salad. Because the leaves are a little tougher than most salad greens, I dress my insalata di shcaroleand then leave it to wilt in the fridge for 30 minutes. Slice the brown root ends off the escarole, then gather the leaves and slice horizontally into 1 inch-wide ribbons. Add the oil, vinegar, anchovies, shallots, red pepper flakes, and salt to an old jelly jar or bowl. Mix or shake well until all the ingredients are well-blended. You may also stir with a fork to further break down the anchovies. 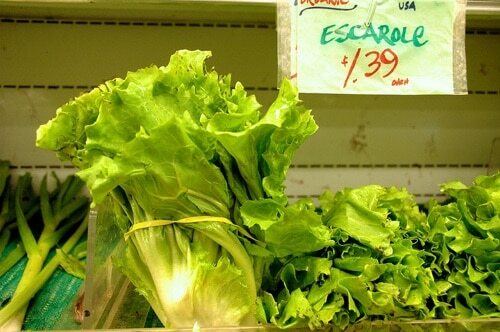 In a large salad bowl, combine the escarole and dressing and leave it to wilt in your fridge for 30 minutes. Top with slices of hard boiled egg.